Merry Christmas to you all, fill up your life with love, compassion, tolerance, peace, happiness and perhaps hopefully some time for modelling. OK so it’s Photoshop trickery…my Milholme model of 21C14 is in slightly unfamiliar surroundings, but Merry Christmas and Happy New Year to you all! As the festive season and New Year break is upon us, I just wanted to say many thanks to all of you whom have taken the time to read my ramblings over the past 12 months. I hope you have found such ramblings interesting and informative. I have also enjoyed corresponding with many of you that have made contact me either directly at shows, email or via the comments field on my various posts. I look forward to corresponding with you again in the New Year. My outings with either Canute Road Quay or Fisherton Sarum planned for 2019 and beyond can be found on my Exhibition Diary page here. I thanks those friends and family whom have assisted me exhibiting / playing with my train sets during 2018. I would also like to take this opportunity to thank the various manufacturers, publications and retailers whom have allowed me privileged access to some of their plans and developments and often taken on board feedback, suggestions and advice, with the sole aim of promoting and furthering modelling of the Southern Railway / Southern Region. Seasons greetings, whatever your faith or beliefs, Merry Christmas and a Happy New Year to you all! It’s a cold, crisp and frosty December morning as we approach Christmas at Canute Road Quay and the crew on board ex LSWR Adams B4 Class No. 100 try to keep warm whilst shunting on the quay as flurries of snow start to get heavier. As the festive season and New Year break is upon us, I just wanted to say many thanks to all of you whom have taken the time to read my rambling over the past 12 months. I hope you have found such ramblings interesting and informative. I have also enjoyed corresponding with many of you that have made contact me either directly at shows, email or via the comments field on my various posts. I look forward to corresponding with you again in the New Year. A further flurry of activity will be taking place at the start of the new year with both Bachmann and Hornby announcing their new ranges within a day of each other on the 7th and 8th January respectfully and I will bring you all the exciting Southern Railway / Southern Region related news on here as soon as their announcements are made. I once again take this opportunity to thank the various manufacturers, publishers and retailers whom have allowed me privileged access to some of their plans and developments and often taken on board feedback, suggestions and advice, with the sole aim of promoting and furthering modelling of the Southern Railway / Southern Region. Seasons greetings, whatever your faith or beliefs, Merry Christmas and a Happy New Year to you all! Fill up your life with as much love, compassion, tolerance, peace, happiness as you can and hopefully some time for modelling! It’s a cold and bright December Morning as we approach Christmas at Fisherton Sarum and snow lay round about, lightly dusting, crisp and even, although services have so far been largely unaffected (remember when that was the case, stikes aside?). As the festive season and New Year break is upon us, I just wanted to say many thanks to all of you whom have taken the time to read my ramblings over the past 12 months. I hope you have found such ramblings interesting and informative. I have also enjoyed corresponding with many of you that have made contact me either directly at shows, email or via the comments field on my various posts. I look forward to corresponding with you again in the New Year. I would also like to take this opportunity to thank the various manufacturers, publishers and retailers whom have allowed me privileged access to some of their plans and developments and often taken on board feedback, suggestions and advice, with the sole aim of promoting and furthering modelling of the Southern Railway / Southern Region. Seasons greetings, whatever your faith or beliefs, Merry Christmas and a Happy New Year to you all! Fill up your life with love, compassion, tolerance, peace, happiness and perhaps hopefully some time for modelling! 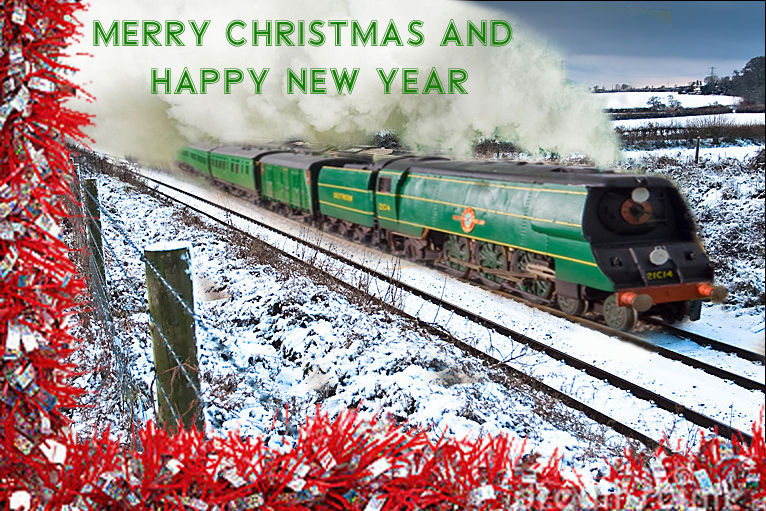 OK so it's Photshop trickery... my 21C14 is in slightly unfamiliar surroundings, but Merry Christmas and Happy new Year to you all! Once again, we come to the Holiday Season, a deeply religious time that each of us observes, in our own way, by going to the shopping centre or online store of our choice! If I were a philosopher, I would write a philosophic piece about toys, showing that nothing else in life need to be taken seriously, and that Christmas Day in the company of children is one of the few occasions on which men become entirely alive; but as most you reading this are doing so because you already have an interest in model railways you probably know that already. Sometimes however the opportunity, or should that be excuse, to play with children’s toys (in my case Lego) should not be missed! There are some that say that there are three phrases that sum up Christmas: Peace on Earth, Goodwill to Men, and Batteries not included. On the basis of this perhaps I should give my nephews a set of batteries for Christmas with a note on it saying, toys not included! Novelist Oren Arnold once wrote: Christmas gift suggestions: to your enemy, forgiveness; to an opponent, tolerance; to a friend, your heart; to all, charity; to every child, a good example; to yourself, respect. Getting back to model railways, for the last few years Hornby have made their announcement about their new range of models to be issued during the following year (well that is always the intent) on Christmas Eve, their announcement about their 2012 range will be now be made on the 3rd January, They have promised that there is to be no letup in the development of new models and, despite previous supply issues they expect there to be no carryover of new models into 2013. I am sure the announcement will include some green coloured items for the Southern or Southern Region modeller and I will post information about their release plans when I am able to. To all who have read my ramblings during the year my compliments of the season to you and very best wishes for 2012!